Weldcote Metals has introduced C-Prime and C-Prime Plus ceramic flap discs for grinding. The C-Prime discs feature strong polyester backing for aggressive grinding applications not requiring excessive flexibility. The C-Prime Plus discs offer a reported industry first, poly-cotton backing, along with high-quality ceramic grain. Together, these features provide excellent stretch and flexibility, according to company officials, while adding enough strength to maximize the aggressive cutting points of ceramic grain. 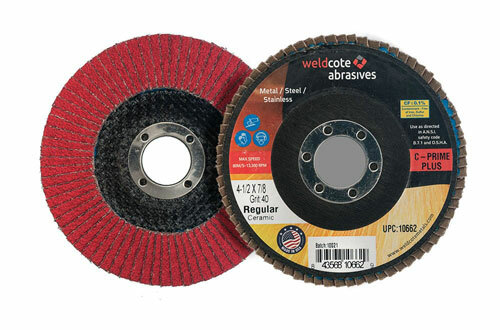 The ceramic grains in Weldcote’s line of flap discs contain a grinding aid for cooler running temperatures, which reportedly reduces the risk of discoloration and heat-induced deformations of the final workpiece. These ceramic grains also are self-sharpening, allowing for longer use, according to company officials. Sizes for the C-Prime flap discs: 4.5 and 7 in. ; for the C-Prime Plus discs: 4.5, 5 and 6 in. See also: Weldcote Metals Inc.